Type: Lithium. Voltage: 6.0 V.
Width: 77 mm. Height: 95 mm. Thickness: 6 mm. Price: £14.00 each. Postage and packing included. 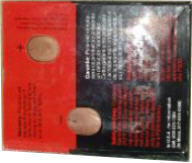 Polaroid Polapulse P500 lithium button cells are no longer manufactured and can be hard to find. We are delighted to have secured a source of top quality P500 batteries. This P500 battery perfectly fit the iconic Sinclair FTV-1 flat screen pocket television made in the 1980s. This Polaroid P500 / Powerdex 6A1400 battery was designed to be interchangeable with the Polaroid P100. The major difference is that the Polaroid P100 is a 6 volt zinc-manganese dioxide battery, whereas this P500 battery is a 6 volt lithium-manganese dioxide battery. The capacity of the Polaroid P100 battery is significantly lower which means that it will only last for about one-quarter the duration. There are only a limited number of these lithium P500 batteries available, so we urge you to buy two or more. Make sure you are not left indefinitely without power the next time your P500 battery runs out.